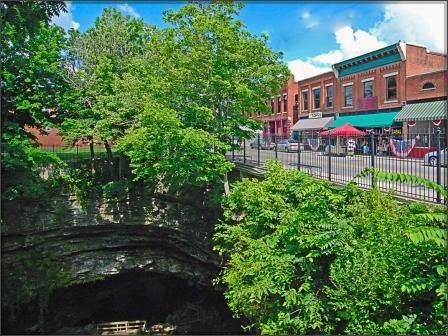 Cub Run Cave, located in scenic Hart County, Ky., was first discovered in 1950. It was then briefly shown to the public before being closed for the next 55 years. The cave reopened to the public in July 2006. New elevated wooden walkways and modern lighting were constructed for the public’s safety and convenience. Come discover for yourself one of Kentucky’s newest and most beautifully decorated show caves! The American Cave Museum is a self-guided museum with two floors of exhibits dealing with caves, groundwater and pollution. Guided tours descend 150′ underground. Hear the history of Hidden River Cave, why it was closed for 50 years and it’s phenomenal recovery. View the remains of a turn of the century hydroelectric system, walk above the Hidden River and witness awe-inspiring chambers. Cave tours last 45-60 minutes and are scheduled upon visitation; roughly 45 minutes apart. Reservations not required. Visitors descend and climb 230 stairs and navigate an outside trail. Group rates are available for groups of 10 or more. 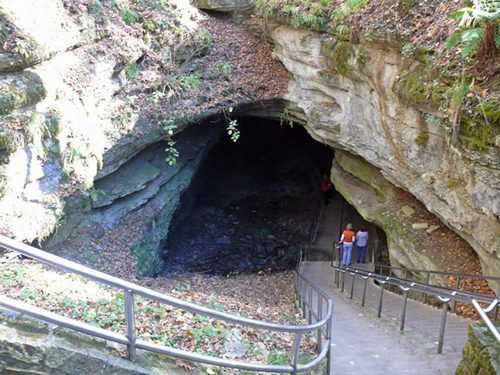 Lost River Cave has one of the largest cave openings in the Eastern United States. This feature was utilized for shelter by Native Americans as early as 8,000 BC and by early United States settlers in the 19th century as a place for milling using water power of the river. In the 20th century an “Underground Nite Club” was created and operated until the early 1960’s. Electricity for this establishment was generated by a turbine driven dynamo. This “Nite Club” dance floor has been restored and steps are underway to renovate the turbine and generator for “green power” demonstration. A Tour of the Cave and Valley includes a 20-minute Historical River Walk to the Cave opening emphasizing history, geology/hydrology, and folklore; followed by a 20-to-25 minute Boat Tour into the cave. The boat tour enables the visitor to view the large rooms of the cave and its other interesting features. This boat tour uses three boats acquired from Mammoth Cave National Park which were previously used for the Echo River boat ride in Mammoth Cave. Visitors will marvel at the beautiful onyx formations found in the underground chambers of Kentucky Caverns. The leisurely cave tour features stalactites, stalagmites, and other formations created by water and time to effect an incredibly beautiful underworld scene. Included as a part of Kentucky Down Under – an Australian themed Animal Park, Kentucky Caverns (formerly Mammoth Onyx Cave) is one of the gems of Kentucky’s “Cave Country.”Although the cave contains some steps, a small group size and leisurely pace accommodates most people. Guides welcome questions and conversation during a 45-minute tour in a comfortable and constant 60 deg setting. Kentucky Caverns is open daily, except for Thanksgiving Day, Christmas Day, and New Year’s Day. Please note: Kentucky Caverns is not handicapped accessible. “hideout” because the natural opening is large enough to ride a horse in. 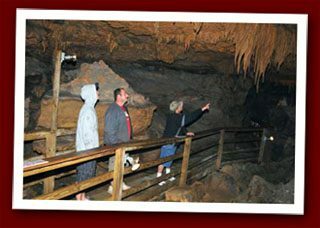 A tour in Outlaw Cave is perfect for the whole family, where its short length, few stairs, and affordability makes it easily accessible to all. OUTLAW CAVE offers a lantern tour daily as well as normal tours. Outlaw Cave is part of Kentucky Action Park and Jesse James Riding Stables, located just minutes off of I-65, Exit 53 on the way to Mammoth Cave National Park.